Most of the procedures for moving infantry formations and the tactics used on the battlefield during the Civil War were derived from those used during the Napoleonic and Mexican-American wars that took place earlier in the 19th century. The infantry of Co. A, 3rd Maine drill to learn these same maneuvers and employ them on the battlefield. The customary Civil War infantry attack was by mass formation, men shoulder to shoulder, two lines deep. During the Napoleonic Wars this tactic increased the effectiveness of the inaccurate smooth bore muskets that were in widespread use. Since the majority of small firearms used in the Civil War were rifled, however, the greater accuracy of the muskets often resulted in high casualties to the target infantry formations, even at relatively long range. Keeping infantry soldiers in close line formation did have some advantages. It made it easier for the officers to maintain control of their units and relay commands (Remember, there were no radios! ), and it lessened casualties from bullets and solid cannon shot plowing through the formation from the front or rear. Lethal missiles directed at the formation from the flanks (sides) could travel along the length of the formation lines doing great damage, so protecting the flanks of infantry formations during battle was of paramount importance. As did the men of the original 3rd Maine, our infantry use three-banded rifled muskets, typically the 1861 Springfield or 1853 Enfield. Safety is our top priority during musket fire training! People under the age of 18 who are physically able to safely handle a 10 - 11 pound musket may join our ranks, but only with the written permission of a parent or guardian. Carrying a musket at out of state events or events with other units is allowed only by people who have reached at least 16 years of age. (Check out our firearm policy here.) We welcome women in our infantry ranks, so long as an effort is made to appear male to the public from a distance. The infantry of Company A is organized around the same type of military structure used in the 1860's. We are commanded by a Captain. The 1st and 2nd sergeants have direct responsibility for the men, and orders are relayed to individual privates though three corporals. Upon joining the infantry a "fresh fish" is assigned to the Third Squad for training and is partnered with a veteran. Upon completion of his training the soldier is awarded his infantry horn and transferred to one of three regular squads. The veterans in our unit who have "seen the elephant" (the Civil War phrase for experiencing combat) wear the red, diamond-shaped Third Corps, 1st Division Kearny patch (see Unit History) on their caps. Our commissioned and noncommissioned officers are elected each year by the military membership. The honor of escorting a regiment's colors was given to individuals selected from the companies of the regiment as the color bearers and color guard. 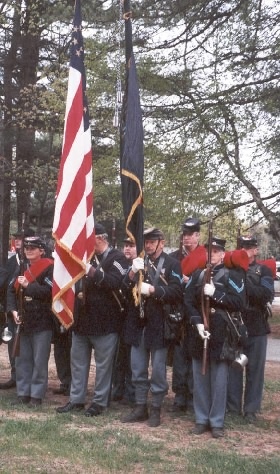 The color bearers were usually sergeants and the color guard were corporals. This select squad was placed in the ranks on the left of the color company, and the color company was placed just to the right of the regiment’s center when it was in a line of battle. This arrangement placed the colors at the regiment’s center. The color squad was composed of a national color bearer and a regimental color bearer with seven color guards. If the regiment had only one color, the color squad would consist of a bearer and eight guards. The color guard was a target of enemy fire and it took brave men to volunteer for this job. Capturing the colors was a battle trophy: loosing your colors was a dishonor. The casualties in the guard were always high. When the bearer was unable to go on, another member of the guard would move forward to rescue the flag. The flag of the regiment served as a rallying point for the men and often indicated the location of its leaders. The flag and its bearer usually lead the regiment into battle, therefore offering themselves as the first targets to the enemy. You can see pictures of Maine regimental colors at the state archives here. Assistant Surgeon Lt. Scroggins and Steward Hall upon their return form the regimental hospital. The assistant surgeon and steward are responsible for the health of the men, in camp on on the battlefield. Medical care in the mid-19th century was hampered by a lack of understanding of how the human body works and the causes of disease. The discovery that bacteria are responsible for wound infections, for example, was made a few years after the end of the Civil War. In addition, physicians were for the most part poorly trained. The majority of medical schools in the United States were private proprietary affairs which provided little practical clinical education and a two-year curriculum in which students took the same courses both years! As the War began no one anticipated the degree to which the small, poorly organized military medical staffs would be overwhelmed by the very large number of casualties that would result. During the course of the War substantial improvements were made in medical system infrastructure and care available for the wounded. Many of these innovations continue to this day, including triage procedures, the nursing profession, and surgical methodologies. It is important to note that for every soldier who died as a result of a battlefield injury in the War, two others died of disease. Union Army regiments were typically assigned a surgeon and an assistant surgeon. Between battles, the surgeons spent the majority of their time administering treatments for diseases, such as dysentery, respiratory ailments, measles, malaria, and a host of others. During a battle, the surgeon performed most or all of the major surgeries in whatever field hospital facilities could be constructed or commandeered, while the assistant surgeon took a post at an aide station set up near the battle line. Wounded were taken to the assistant surgeon who provided initial treatments and arranged for the more seriously wounded to be sent to the surgeon by horse-drawn ambulance. At the field hospital, care was first given to those most likely to survive, generally those with arm and leg wounds. Amputation was by far the most common type of major surgery carried out in the field hospitals. Nursing care in the field was often provided by inexperienced, often wounded, soldiers. As the war progressed trained soldiers, called stewards, took over some of the nursing care in the field, and there are some examples of intrepid women resisting the social mores of the time and braving the horrors of the field to help with the care of the sick and injured. Many more women, along with military and civilian contract surgeons worked in large city hospitals that provided care for soldiers whose wounds or illnesses required long periods of treatment. 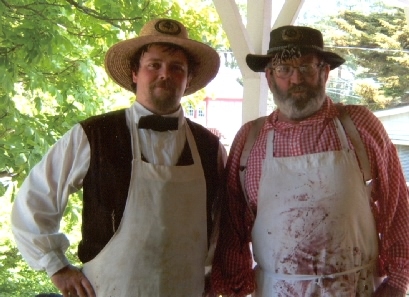 Assistant Surgeon Scroggins, Steward Hall, and Mother Mallet (Lee Dionne), provide the 3rd Maine with a Civil War medical impression, often assisted by the Ladies of the Maine Camp and Hospital Association and the U.S. Sanitary Commission. The Chaplain encourages a new recruit private. The Rev. Henry C. Leonard served as the Chaplain of the 3rd Maine, often under difficult circumstances. Charles McGilliguddy portrays Rev. 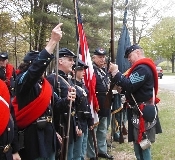 Leonard in the current 3rd Maine Infantry.